Lol, this is a bulldozer....Caesar the retic when he isnt fed at the 10 day mark That hide wasnt on the end of the cage before he got pissed about no food and he is quiet because this was after he got a jumbo rats lol. LOL, they sure like to re-arrange, don't they ? He definitely DOES beat a Ball Python!!! I still like the display cage for my large male, but I have learned that it has to be somewhat simplistic and easy to maintain! Haha yeah Dottie used to flatten plants and break her vines which i dont know how she did it. And yup, come morning all you saw was her in a hide all nice and quiet lol. I keep all their cages simple now but the GTP i kinf of want to add the plants but still keep the floor simple so i can easily spot poops and pisses and clean them right up. And you're getting tempted??!! 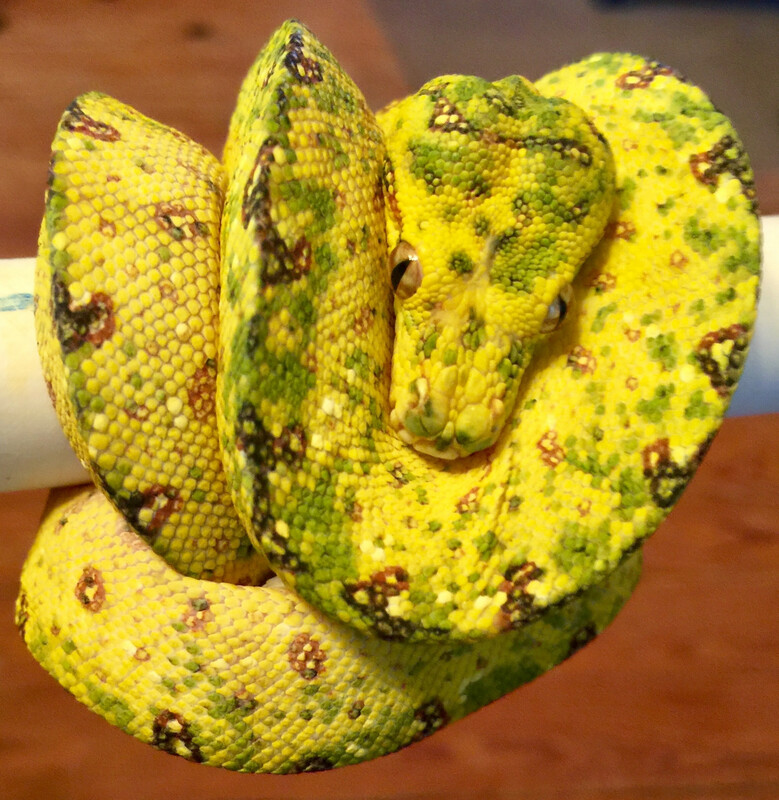 Heck I'm already planning out my next GTP...maybe a nice sorong!! And I'm already planning the cage for Pat. 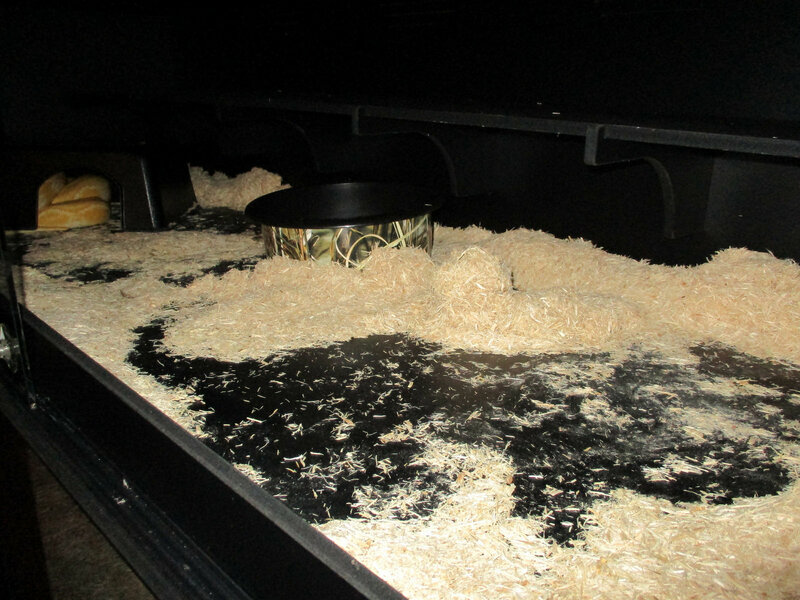 Thinking either an Exo Terra 12x12x18 or 18x18x18 or 18x18x24 and then get a couple of those suction cup gecko food holders and stick them up by the high perches for elevated water bowls and have the big water bowl on the floor. Just not sure what size cage i should go for. I know they dont really need the height and use the length more since they are more horizontal on the tree tops and not really climbing the trunks of trees up and down lol. Thats why im kind of leaning towards a 18x18x18. Half the fun is planning everything out I think some sort of coco substrate looks best in a GTP setup. Holds humidity well, looks awesome, no smell and easy to clean. My GTP's enjoyed drinking from their own skin folds as well as the droplets on the plants, after a nice misting But they also used their water dish. They really are to much fun to observe, even when they are just "sitting around"
This thread has now been re-opened and cleaned up this is will be my LAST WARNING, if the drama that has involved a few individual over the past few weeks continues here or elsewhere, those threads will be locked PERMANENTLY and CUSTOM INFRACTIONS will be handed out. You all are adults and if you cannot play well with others just do not play at all or be ready for the consequences. I’ve got a couple of the Exo-Terras sitting in storage, wish I had a teleporter! Seeing all those awesome GTP pictures really makes me wish I still had all my pictures!!! I used to have a TON of reptile pictures. There were my GTP's, brazilian rainbow boa, rubber boas, my Borneo python, my huge 4500 gr. rescue Ball Python and her clutch, so many cool pictures. I had awesome pictures of handling my GTP's !! Back then many people (incl. me) used a certain picture hosting website. I stored ALL my reptile pictures on there. One day out of nowhere it went "bust". You couldn't even get to the pictures to save them elsewhere. They "offered" to release the pictures to their owners on a Photo CD for the fee of $50 or thereabouts. Most people figured it was a scam and didn't do it. I was unsure of what to do and waited to long. Pictures were lost forever, it still hurts me to think about it. Every so often I google my old usernames for forums and the names of the snakes, if there are some pictures somewhere that ended up saved somehow. But no luck. You want GTP pics? Have a GTP pic on me!